The Toyota Supra is a sports car/grand tourer that was produced by Toyota Motor Company from 1979 to 2002. The styling of the Toyota Supra was derived from the Toyota Celica, but it was both longer and wider. Starting in mid-1986, the Supra became its own model and was no longer based on the Celica. In turn, Toyota also stopped using the prefix Celica and began just calling the car Supra. Due to the similarity and past of the Celica's name, it is frequently mistaken for the Toyota Supra, and vice versa. The Supra also traces much of its roots back to the Toyota 2000GT with the main instance being its engine. The first three generations were offered with a direct descendant to the Toyota Crown's and 2000GT's M engine. All four generations of Supra produced have an inline 6-cylinder engine. Interior aspects were also similar, as was the chassis code "A". In 1998, Toyota ceased sales of the Supra in the United States and in 2002 Toyota officially stopped production of the Supra in Japan. 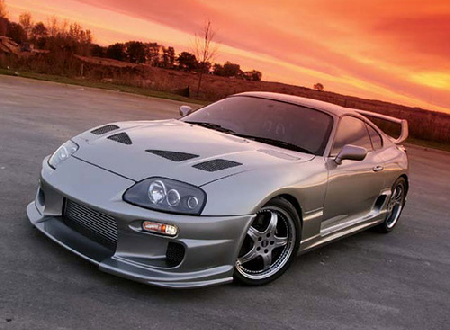 As an iconic sports car, the Supra has appeared in numerous video games, movies, music videos and TV shows. Some of the most notable appearances include the Gran Turismo, Forza Motorsport, Need for Speed, and Midnight Club series of video games and the 2001 film, The Fast and the Furious.